Great roads leave the city travelling to the North, South, East and West. Then, the Forest of Loss encroaches, blocking travel in all directions. It is said that to the North, there is a huge sea. A sea is like a river, but big and wide and the water is brackish and unsuitable for drinking. It is said to the South, there was a city which was second only to Rastaban. To the East, it is said, there is a huge and majestic mountain. A mountain is a like a very large, very rocky hill. In the Golden Age, it is understood that the West was a place of great abundance, producing many fine fruits, plants, and spices, the names of which have been lost to history. As of Viam Inveniam Aut Faciam some more is known about the outside world. The region around the river Eriden (known as the blightwater outside Rastaban) is blighted and inhospitable due to the effects of the corrupted river running through it. This has led the region to not be claimed by any great power and instead a motley town called Fools Landing has cropped up home to those who cannot find a place elsewhere. As of the events of Casus Belli fools landing is now a smoking ruin occupied by the Empire of Rastaban. 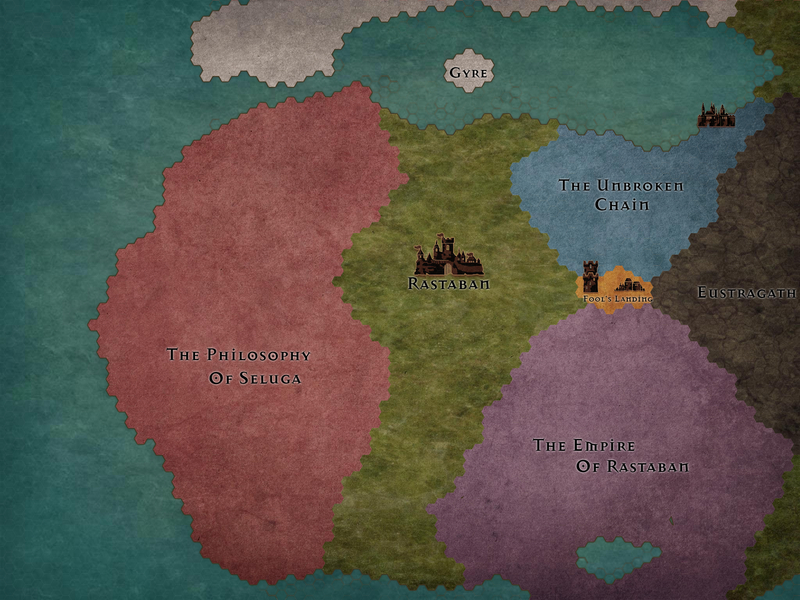 A large militaristic nation to the south, they are actively expanding northward - into the region of fools landing. They do not worship any Muses, but do follow three paths: those of the mind, body, and spirit. These seem to correspond roughly to the Throne, the Rod and the Torch respectively. They link their nations with wayroads which speed travel. A nation ruled by several dynasties of plane binders. A large nation of the other side of the Forest. Not much is known of them other than that they are ruled by a council of philosophers. A mountainous region to the east. An island nation to the north.